Long time linux/unix hackers know of the plethora of window managers and user interfaces that have been and currently are available for Linux and BSD operating systems. I’ve had great times in the past trying out different window managers such as Elightenment, Sawfish, Black Box, IceWM, xfwm, KDE, Gnome, and others. 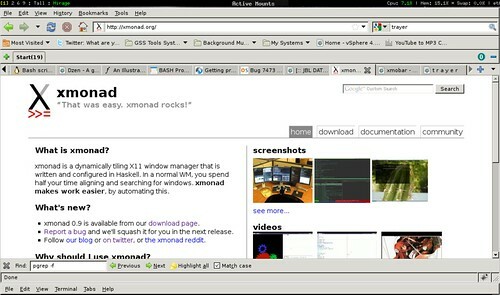 These days the two most popular which are shipped with the more popular distributions (Fedora, Ubuntu) are KDE and Gnome. However, I remember back in the day when I was using a Enlightenment, or Ratpoison, doing strange and cool things (at the time) like applying transparencies to your windows and modifying the the window borders to be anything but normal and square. I used to share screenshots of my desktop with others who are also into “desktop eyecandy”, where I’d have floating or docked window maker panels, and monitoring applets anchored to the desktop as if they were part of the background wallpaper.. and this was around 1999. It was fun times. One of the more interesting things that I was into at the time was increasing the efficiency and usability of my desktop by trying to reduce the need to reach for my mouse. I’ve been very accustomed to this already being user of vi and the GNU Screen terminal multiplexor, but the window managers never seemed to try to attain the same level “hacker cool”. That is, of course until I came across Ratpoision. Ratpoison was exactly what the name implied, a window manager that killed your dependency on the mouse (or rat). It was awesome, but it wasn’t scalable and didn’t evolve much to keep up with modern technological advancements and requirements such as multi-monitor support. I recently thought that those days were long lost, until I recently had the urge to streamline my desktop environment. I now have a 28″ Monitor, and was certain there was a better way to interact with the desktop than the standard Ubuntu/Gnome environment. So I went looking. I started looking of course at things I was already familiar with – I looked up Ratpoision to see if there were any major improvements over the years. I took a look at a Ratpoison again, but it was showing it’s age. I looked at it’s successor, Stumpwm, but I didn’t feel the love. Then I tried out Xmonad, created by Spencer Janssen, Don Stewart, and Jason Creighton – and written in Haskell. I immediately fell in love. We’re going to create another X window session, so that we don’t mess with your existing one. That way, if you don’t like Xmonad, you can go back to using your existing window manager without worrying about breaking your configuration. This will start up another X session which will sit at virtual terminal 12 – meaning that you have to press ‘ctrl-alt-F12′ to get to it. Once at your new X session, you should see nothing more than an plain old xterm window. 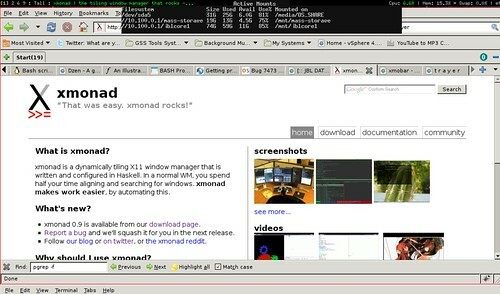 Type “xmonad’, and the terminal window should now be maximized. Xmonad is now running. Type ‘man xmonad’ to view the help documentation on how to use it. It’s pretty straight forward, and a joy to use!